We will explore the scientific origin of the 5 elements used in Feng Shui cures-- Water, Wood, Fire, Earth, Metal -- and provide fascinating new insights as to why and how they have been consciously placed in environments to adjust Chi for centuries. 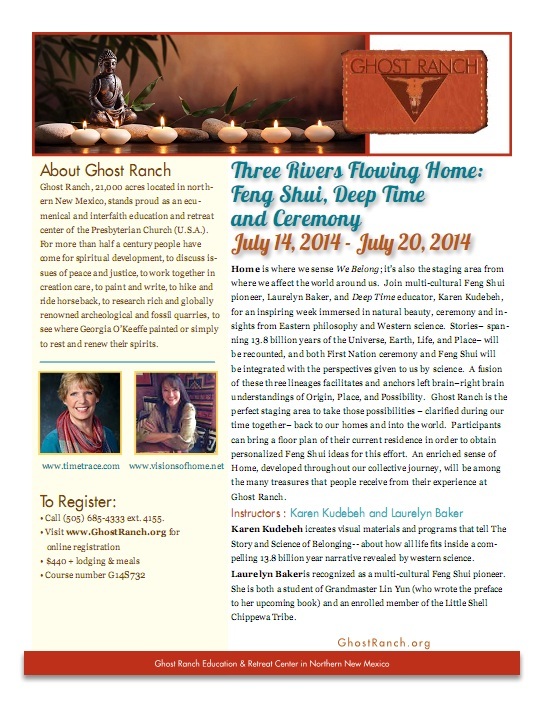 Professionals, more casual practitioners, and those new to the art of Feng Shui will be shown the importance of honoring the unique energies inherent within our home continent of North America (known by many of the First Nations as Turtle Island) when applying the spiritual knowledge that arose from a different land base in the East. As a group, we will design collective cures that can be installed in our homes with the intent to assist important causes in the world beyond our own walls, as well as learn advanced methods to create a beautiful and empowering home base. All teachings will be conducted within the framework of Native based ceremony so that information which is usually presented on a purely intellectual, Eurocentric level will instead be introduced in a respectful and inclusive manner. You will access the latest scientific narrative of the 13.8 billion year old origin of our cosmos using the Spiral form already familiar to indigenous cultures. We will provide --thru this powerful image—a means of bridging the worlds of indigenous and western ways of knowing. Special attention will be paid to Turtle as a guide between these points of view. All participants will be gifted a set of TimeTrace spiral timelines to take home to share with others. These valuable teaching tools are revolutionary in their ability to convey the story of Deep Time/Big History -- and to focus on our place within it-- for life-long learners, teachers, and students both within and outside the classroom. We will ground an overview of Big History into a story of Place. Thus we’ll work with contrasting perspectives of both Eagle and Mouse—going from the Story of the Universe all the way into the Story of Ghost Ranch—its geology, paleontology and history. We’ll engage multiple senses in learning about Place, adding meaning and power in connecting to Earth. For those holding the grief around the current state of Earth’s diminishing life community, this larger perspective of time can be quite useful for renewing one’s personal power to carry on in the world. Most important, you’ll access knowledge, techniques and ways of being that will carry over to your own home when you leave Ghost Ranch. You’ll have structure to identify the Deep Time story of your place, you’ll have knowledge of Placement to apply to your own home, and you’ll remember that wherever you are is Sacred Ground.